The Community of Sant’Egidio is facing the increase in widespread violence in various parts of the world. According to recent statistics, the most violent areas of the world are the Mesoamerican states, particularly Honduras and El Salvador. The number of homicides committed in these countries is greater than the deaths caused by the civil wars of the 80’s and 90’s. In El Salvador, there are 79 homicides per 100.000 inhabitants, in Honduras there are 92, whilst, for example in Italy, the data points to 1.1 homicides for every 100.000 inhabitants. The link between the drug trade and the increase in violence in this region is evident, as is social exclusion and inequality. However, we must not underestimate the mentality produced by the decades of conflict: the only way to resolve any issue was through the use of weapons, enforcing the law of the strongest. The Community of Sant’Egidio is operating in Central America to oppose this mentality. With this outlook the Community’s presence in supporting children is increasing, with clearer objectives for training and “humanizing” young people. But also adults who have been seduced by violence and are struggling to find a way out. New Schools for Peace have been opened in the outskirts of El Salvador. High School students are involved in educating and instructing people about peace and legality, in areas in which these topics seem too difficult to deal with. This is our challenge in El Salvador. Since our arrival this has been our dream, to redeem humanity. The same dream as William Quijano, of the Community of Apopa (see photo), who was murdered by the maras (local youth gangs), in September 2009. The work of the Community of Sant’Egidio also involves the mending of the incredible damage that has been done. To bring reconciliation to those who have been caught up in a spiral of incontrollable violence. Community members regularly visit prisons, bringing food and clothing and talking to the prison inmates about the possibility of a different kind of future. The Community is also growing in the most violent areas of Honduras. 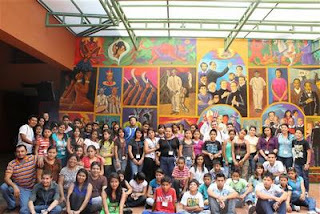 Murales have been painted on all of the Schools for Peace. The theme of the murals is peace, powerfully underlining that it is possible to live in another kind of climate, a climate of peace. The City of Mexico is a boundless, enormous urban area, where challenges seem so big that they cannot be faced. Yet the Schools for Peace continue to grow in presence. We now have 4 schools: Santa Julia, with their street children, Santa Ursula, Pueblo Quieto and Olivar del Conde. These are all poor areas where criminality is closely connected to drug trafficking. Young people are easy prey for these gangs and the familiarity young children have with arms is horrifying. We need to patiently, continue to build a new familiarity with all of these people, through the words of peace, friendship and trust. A familiarity which can overcome fear and aggression and, staring with the very young, can lead to finding an answer to the huge problem of a hard and violent world.